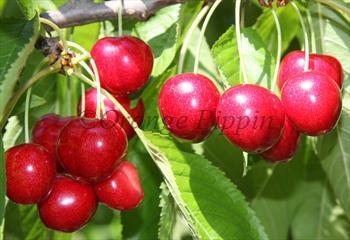 Sunburst is a good modern self-fertile cherry variety, with delicate flesh, and a good sweet mild cherry flavour. It is also easy to pick the large fruits. It can be considered an improved version of the popular Stella cherry, to which it is closely related and shares many of its good qualities. Please fill in the details below and we will let you know when Sunburst cherry trees are back in stock. Sunburst is in flowering group 4. Sunburst is self-fertile and does not need a pollination partner, although fruiting may be improved if there is a compatible tree of a different variety nearby. Sunburst is a precocious cherry variety, and starts bearing fruit within 2-4 years. Sunburst was developed by the Summerland research station in British Columbia, Canada and released in 1965. It is a cross between Van and Stella.